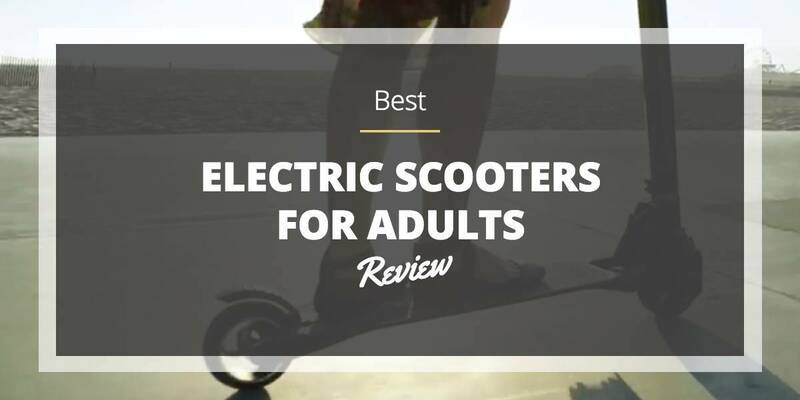 The best electric scooters for adults in 2017 offer solid construction, a range of several miles or kilometers, decent speed and long battery life depending on usage. Thanks to technology, scooters get faster and sturdier. Manufacturers continue to pack features onto scooters, such as LED lights, cool sounds and fantastic tires. The best electric scooters for adults in 2017 make great gifts for winter holidays, and they also represent some basic transportation. Electric scooters allow people to get around on city streets without having to pedal a bicycle or buy a more expensive motorcycle, car or truck. 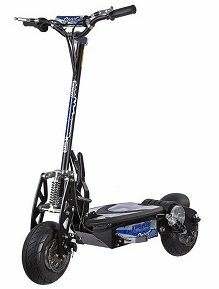 T﻿he E-Flux ﻿Freeride pro electric scooter generates 1,600 watts of power through four 12-volt batteries. The 1600 watts comes in as a higher standard than most 1,000-watt motors. 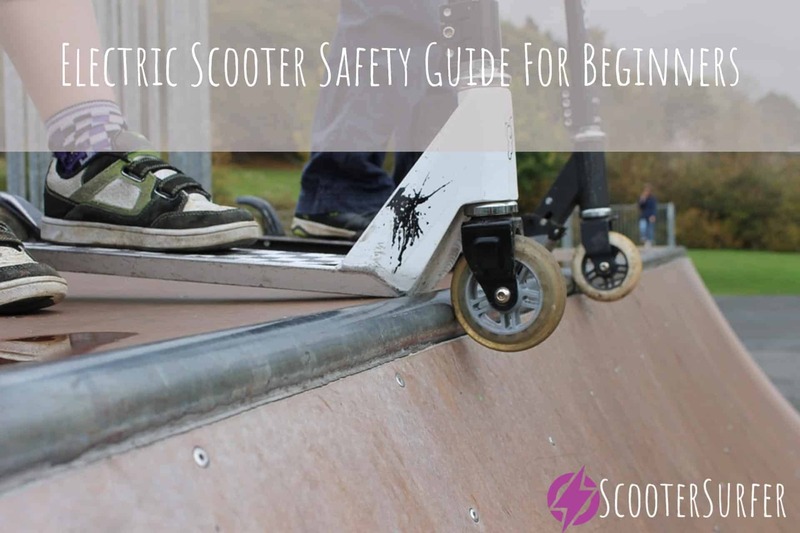 The batteries sit beneath the foot plate of the scooter, so the batteries remain out of the way from the main controls of the scooter. A small LED below the handlebars gives you safety and security as you travel at night. The LED doesn’t necessarily let you see farther ahead of you into the night, but it does let drivers on the street recognize your approach in an otherwise dark night. Two sturdy tires give you a secure ride for years, and a rugged suspension makes your journey more comfortable. 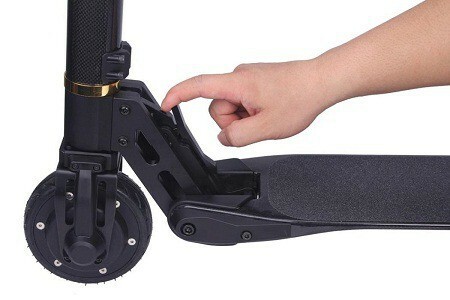 One of the best features of this scooter is the height-adjustable handlebar. Many of these scooters don't have this capability. It's a great scooter for kids that are still growing. The E-Flux Freeride is a great scooter for adults thanks to sturdy construction, and it makes a fantastic gift for the scooter enthusiast in your life. 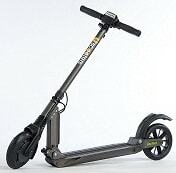 The Evo Powerboard 1000-watt, three-battery electric scooter doesn’t have as much power as the E-Flux model mentioned above, but it still has some features that scooter riders need. The twist throttle increases your speed with the slightest touch. The all-terrain tires stand up to travel on road or off, sunny weather or wet. An LED light points the way in front of you, while a rear LED warns anyone behind you that you’re traveling at night. Travel around 12 miles in one charge, depending on your travel conditions. Move your electric scooter as fast as 26 miles per hour. Put the scooter in economy mode to restrict the speed to 17 mph. This lowers the power rating to 650 watts, which effectively saves battery life and extends your trip. Charge the powerboard electric scooter for a few hours after each use for best results. This sturdy contraption holds up to 265 pounds. This is due to the steel frame. Despite this durability, keep an eye on the chain and keep it oiled regularly. The chain oil helps keep dust and dirt away from the moving parts of the scooter. 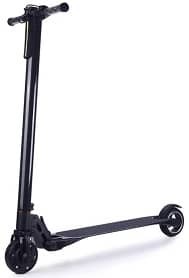 The Glion Dolly foldable lightweight adult electric scooter is one of the best scooters on the market, period. The contraption folds into a compact bag so you can literally take this anywhere. When it unfolds and folds up, the scooter locks into place. Take this on the subway and into your office building and into your locker. With the battery, the Glion Dolly weighs just 28 pounds. That’s easily 20 pounds lighter than other scooters in this review. The portability works thanks to lithium ion batteries as opposed to more traditional and less efficient batteries. The front LED is lower to the ground, so you can actually see more of the things in front of you. There is no back light, but there is a rear reflector that can indicate you are on the road to the motorists behind you. There are caveats to the portability. 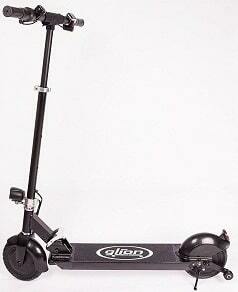 This Gilon Dolly scooter tops out at 15 miles per hour, but the life extends to 15 miles on one charge. If your workplace is 7.5 miles away, you’re set for an easy commute. The charge time is just 3.5 hours, so it’s ready when you have to go to work the next morning. EcoSmart makes several eco-friendly products, and it’s a well-known brand for making sustainable products. The Metro electric scooter is no exception to EcoSmart’s brand identity. This scooter is different in that it uses 16-inch pneumatic tires as opposed to more solid tires. The tires look more like traditional bicycle tires rather than rugged models used in more contemporary-looking scooters. However, this just adds to the charm of this metro electric scooter. The seat has extra padding for a more comfortable ride. Other scooters have narrower seats that don’t provide as much support. The seat is adjustable. Even better you have a small luggage rack behind you, underneath the seat and above the back tire. You can take a briefcase with you to work if you don’t want to take a backpack with you. The motor is just 500 Watts, but that makes the speed lower and it saves power over longer journeys. Travel up to 18 to 20 miles per hour, and there is a run time for 60 minutes total. This is the perfect scooter if you want to commute 30 minutes one way to work. Just lock the scooter next to a bicycle rack at home and at work, and you’re set with emissions-free travel. The E-TWOW Booster 6.5 electric scooter is a sleek, high-tech machine. It’s lightweight and compact, and yet it reaches 18 mph on a 500-Watt motor. The speed can max out at three levels depending on what the factory sets. This scooter folds down in seconds. It also reverts back to an upright position just as quickly. This is a sturdy vehicle due to aluminum construction, and that makes this lighter in weight compared to models made of steel. The small tires aren’t all-terrain, so you can expect to take this on the road or sidewalk as opposed to going off-road. This E-TWOW electric scooter has a double braking system with a regenerative brake for the front wheel, and an emergency brake for the rear tire. The regenerative brake helps recharge the battery in a small way during your trip. The first question you have to ask when looking for the best electric scooters for adults in 2017 is, “What am I going to use this for?” Do you want a fun hobby, or a serious commute? An electric scooter provides an easy way to get around, but you have to contend with the elements. Can you ride this to work in all types of weather? Is this a fun purchase that you ride when you want? You want an electric scooter built well for the conditions. If you get one with off-road tires, find one with steel frame that can handle a pounding. You also want off-road tires. For commutes on roads, consider a lighter-weight model that travels at slower speeds and longer distances. 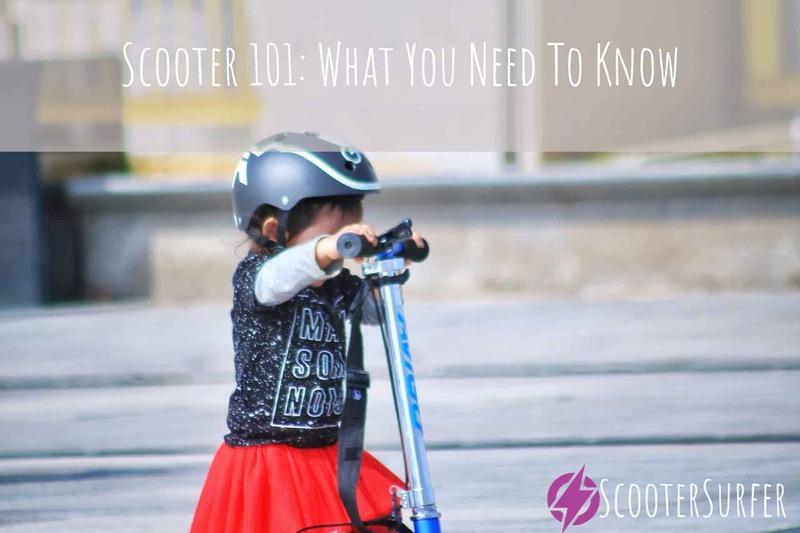 The top speed of scooters usually ranges from 10 to 20 mph. The lower the top speed, the longer the battery lasts. In general, slower speeds also mean less powerful motors. The most powerful motor in this review is 1600 Watts, which is almost three times as powerful as the 500-Watt motors seen in lower-speed models. The key statistic for an electric scooter is how long it can go on one charge. Some models have 60 minutes, while others last two to three hours. If your commute is under an hour, you can get pretty much any electric scooter and make it to work and back on one charge. The E-Flux Freeride gets high marks for the four batteries, high-powered motor and top speed. If you want to move faster and travel longer, the E-Fl﻿﻿ux Freeride is your scooter. However, a great scooter to take to work is the EcoSmart model. That’s because you can lock it up with a bike lock and a bike rack. The removable luggage rack above the rear seat is a huge plus on this one. 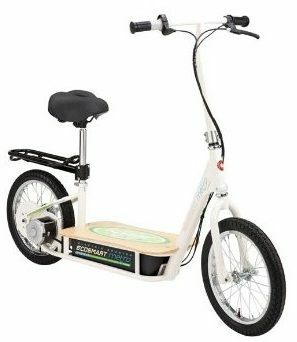 The larger bicycle tires also mean you get a sturdy ride compared to smaller tires on most electric scooters. 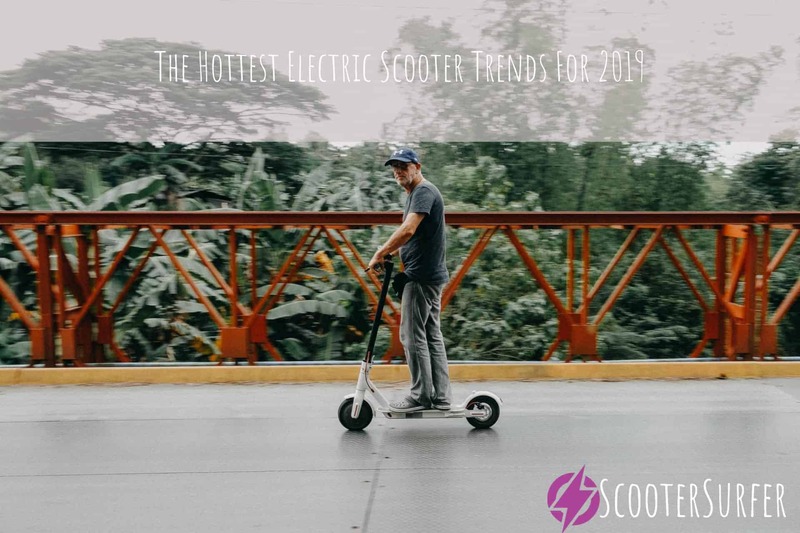 Either the E-Flux or EcoSmart are the best scooters for adults in 2017.